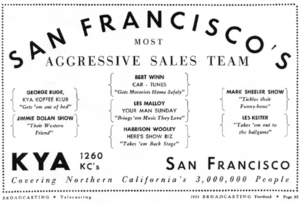 In April of 1950, J. Elroy McCaw and his partner each purchased a 50 percent interest in KYA Radio, San Francisco from Dorothy Schiff, who, incidentally, owned the New York Post for almost 40 years. Dorothy was selling the station at a steep loss from her purchase price due to the fact that the station wasn’t quite profitable, so McCaw had every reason in the world to make some changes. And, as was now his pattern, McCaw hired Les Keiter to be KYA’s sports director. As Les and Lila Keiter (let’s not forget – she was 8 months pregnant) were winging their way back from Honolulu to the mainland for Les’ new job in San Francisco, the west coast was in a post-war boom, and the Bay Area was quickly becoming a major metropolis. Former soldiers from farming families were heading into cities for college and better jobs, and GI’s who had passed through and fallen in love with San Francisco on their way to fight in the Pacific were back to start families of their own. To help accommodate everybody, the last sand dunes in what would become The Sunset District were being leveled for the construction of cookie cutter houses, purchased with loans backed by GI Bill guarantees. 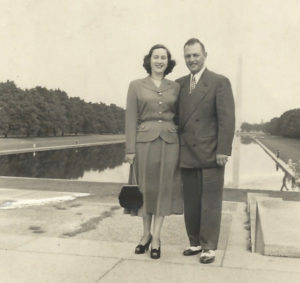 Upon their arrival, Les and Lila set up another house-hold, and Les went to work, broadcasting daily from the Fairmont Hotel in downtown San Francisco, starting mid-season with college football: Stanford, California, San Jose State, Santa Clara, St. Mary’s, and College of the Pacific. 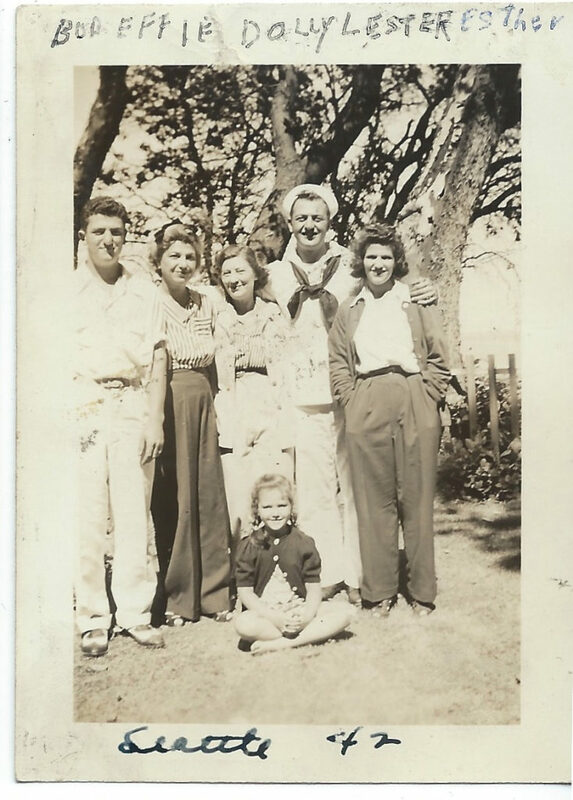 The Keiter’s were still settling in when, on November 10, 1950, Lila gave birth to the their first son, Richard Allan. The family has always called him Ricky, and as Les said, Lila proved to be as adept a mother as she had been a scorekeeper. During the war, a Texan sportscaster named Gordon McLendon (self nicknamed “the Old Scottsman,” even though he was in his early 30’s) had the idea to create a radio network dedicated to bringing baseball recreations to rural areas when, as Time Magazine wrote, “he found that boys from Arkansas argued just as hotly as Brooklynites about big-league baseball, even though the only games they ever heard were the World Series.” The radio network McLendon started in 1948, just two years before the Time Magazine article, was called the Liberty Broadcasting System. McLendon was onto something – people loved listening to baseball! The network’s recreations were jazzed up just enough to keep them believable, while sometimes making them even more interesting to hear than a game called live from the stadium. As stations signed on, minor league ball game attendance rose across the country. The Liberty Broadcasting System had meteoric growth. There were 240 stations in the network by 1950. 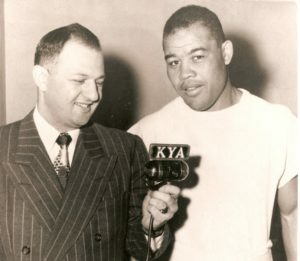 To supplement KYA Radio’s current offerings of college football, basketball, boxing, and other sports with as much action as possible, Les Keiter and station manager Jock Fearnhead signed KYA on to the Liberty network for the 1951 baseball season. By 1952, when Liberty was up to 458 stations nationwide, Major League Baseball realized how much money they’d been leaving on the table and raised their annual rights fee from $1,000 to $225,000. The astronomically increased bill combined with the fact that both professional baseball and football began restricting broadcasts around cities with league teams, and the Liberty Broadcasting System went out of business almost overnight. Here’s a notice from Broadcasting Magazine in which it was reported that Keiter had polled his audience to see if they wanted to hear double headers on Sunday’s. 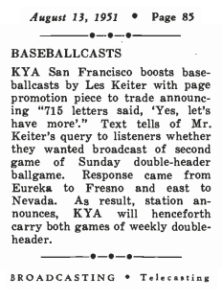 Whether KYA Radio saw the imminent demise of Liberty, or they simply wanted to satisfy the demands of their audience with even more baseball, after one season with the network, Les Keiter and KYA Radio began doing baseball recreates on their own. McCaw’s methods for getting live game statistics for the recreations could be, to put it politely, imaginative. To be blunt, according to Les, they eventually lead to charges of game piracy. Les said McCaw once hired a spotter to phone in the details of Dodgers’ games from a tree overlooking Brooklyn’s Ebbets Field. Keiter filled in the gaps with his own quick imagination. As in Honolulu, recreates of baseball games made Les’s reputation in the Bay Area. By 1952, Lila was pregnant again, and on November 22nd, gave birth to a surprise set of twins, a girl and a boy: Martin Bruce and Barbara Ruth. Les Keiter had been summoned from Modesto, California to a new opportunity in Honolulu, Hawaii by his old boss, J. Elroy McCaw. 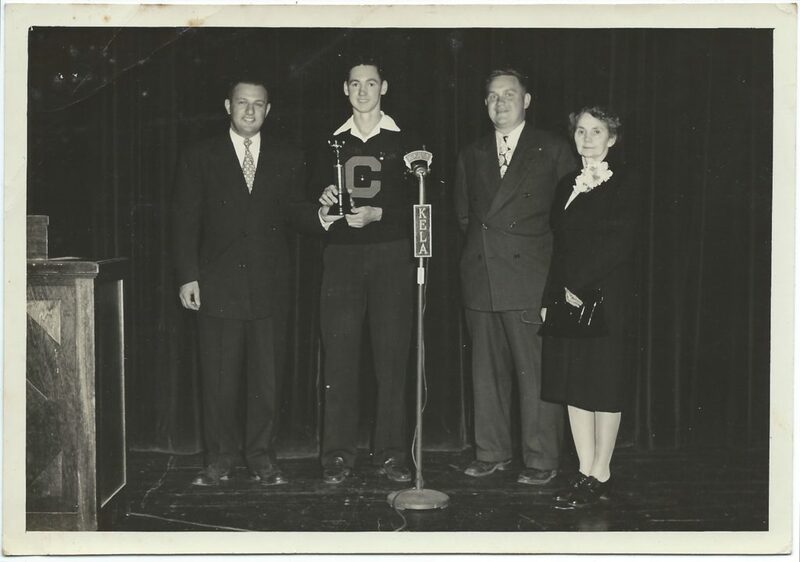 Such is the life of a budding sportscaster in 1949! Les and Lila pulled up stakes and moved to a tiny apartment in Waikiki on Pau Street. Les hit the ground running as the sports director for KPOA-AM radio. Immediately, he began doing baseball recreates on a full-time basis: 2 games a day, 7 days a week. He called Major League ball games in the afternoon, and San Francisco Seals games in the evening. Lila was Les’ official statistician! She kept a huge book filled with the scores, and stats from the 8 Pacific Coast League teams as well as the American and the National Leagues. Hawaiians love all of their sports – not only baseball. In fact, Les was assigned a high school football game to announce four days after his arrival to the islands. Always well researched, Les set about trying to familiarize himself with the team’s rosters. Punahou High School was easy. They had a lot of common names like Jones, Smith, and Obama… But Kamehameha, the opposite team, was another story. To attend that high school, you had to have a certain amount of Hawaiian blood in you, and therefore names got a bit more complicated. They had 4 brothers on the squad: the Kalaukukui brothers. Tommy Kalaukukui was the quarterback. He threw 16 passes to Harry Kahuanui. Imagine calling that game! Kalaukukui to Kahuanui 16 times! Les laid the groundwork for his life-long love affair with Hawaii because of his sense of humor and sensitivity to the local community. Les Keiter, Gloria McLean Stewart, and James Stewart in Waikiki. 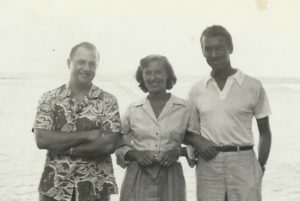 The Stewart’s visited Hawaii for their honeymoon, where they enjoyed Keiter’s announcing, and the couples became friends. In his later years, Les spoke wistfully about the time he and Lila shared together in those early days of their marriage and the early days of his career. When they had the time, they played canasta with friends, went to the cinema, took in shows at the Waikiki hotels… They felt like they were on perpetual vacation! A little more than a year after they’d arrived, Lila became pregnant. She had carried on her job as statistician until, as she said, she decided to make a few statistics of her own. Eight months into her pregnancy, having been given the go-ahead by her doctor, Lila and Les flew to San Francisco to set up their third home in as many years. When Les Keiter was a small boy, he loved the Seattle-area baseball announcer Leo Lassen. In fact, he idolized him. Leo was renowned for his depth of knowledge and insistence on accuracy. He was a master in the art of the Baseball Recreate. And little Les spent his time trying to emulate his hero by making up his own baseball tournaments – adding the element of suspense by rolling dice to determine the plays, while announcing the imaginary games in his best approximation of Leo Lassen’s style. Les even kept score books of those made-up games, which his mother held onto for years! When we last left off with Les Keiter’s story, he had survived the war, come home, and married his sweetheart (and expert baseball scorekeeper), Lila. They ended their honeymoon adventure in Los Angeles, and drove to their new hometown, Modesto, California, where Les (unbeknownst to Lila**) had taken a job! Les went to work at an FM station, KBEE-FM, as part of the Eleanor McClatchey radio empire. Not a lot of people had FM receivers at that time, but McClatchey had correctly guessed that it would be the medium of the future. By filling their FM airwaves with sports, they were able to corner the FM market in their area. Les was off to the races – announcing the Modesto Reds and Stockton Ports home games live and doing Baseball Recreates when they were away. What the heck is a Baseball Recreate? “Baseball Recreates,” you may be asking? This was in the time before satellites and other high-speed communication, so when a local ball team traveled out of radio frequency range to play a game, the only way baseball fans could know what was happening in real time (or, close enough), was to listen to a Baseball Recreate. The announcer would be in the local radio station receiving the game stats through telephone or teletype or telegram… whatever worked, and he would announce the game live on the radio using the real game stats, his wealth of knowledge about the players and the field, and a smattering of imagination to make it sound as if he was seeing the game being played in front of him. The announcer or radio producer would fill in with sound effects for bat-cracks (Les preferred to do those himself with a drumstick and a wooden block), crowd noises, or whatever else was necessary to make the experience as authentic as possible. The audience was told before the game that it was a recreation, so it was all above board, but it’s said that many people “knew, but didn’t want to know” they were listening to a Recreation. This was where a baseball announcer’s individual skill and imagination could really shine. This was also a decade before the Giants and Dodgers moved from New York to California, so the Modesto and Stockton teams were the biggest baseball attraction in town. 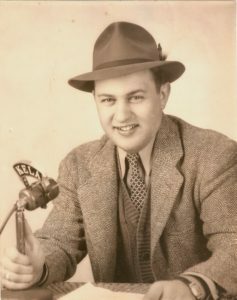 Les also rounded out the baseball broadcast schedule at the station with Recreates from the rest of the Class-A California State League. As far as we know, Les never spoke publicly about how he felt doing his very first on-air baseball recreate, but it’s certain that with all the practice he had making up his own games as a child, Keiter was as well prepared as could be. And all of those Modesto and Stockton Recreates were starting to get him noticed. As luck would have it, the 1949 baseball season was the all-time peak season for fan attendance in the league. Hawaii was a treasure trove of work for a good announcer with Les Keiter’s skills. So Les and Lila packed up and moved from Modesto to Honolulu, where Les would do Baseball Recreates full time. ** Although it was a nice town, upon hearing Modesto was going to be their new home, Lila made her feelings clear, and Les resolved never to make such a decision without Lila’s input again. And he never did. Baseball, Centralia-Chehalis WA, Chicago, Chicago Cubs, Cleveland, Cleveland Indians, General, KELA, Los Angeles, Modesto CA, New York City, Niagara Falls, Seattle, Washington D.C. This is where the matchmaker kicks in. Les’ mother, Dolly Keiter, re-introduced Les to the kid sister to one of his fraternity brothers. Her name was Lila Hammerslough. Lila was 7 years his junior. I say “re-introduced,” because when Les first met Lila, that seven-year difference was the difference between a young adult and a child. Five years and a World War later, that wasn’t true anymore – Lila had grown up! One day, Les took Lila on a date to a Seattle Rainiers baseball game. While watching the game, Les began explaining how to keep score. She put up with him for about 3 innings, then she took the program from him and scored the game herself – even better than he did! Unbeknownst to him, Lila Jean Hammerslough had been the sports editor of her school newspaper. 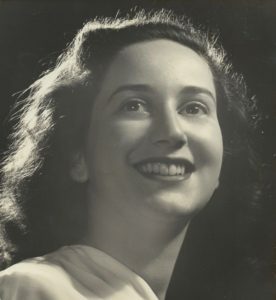 She had been named “Outstanding Baseball Fan” by a local paper, and she regularly listened to baseball games on the radio, announced by Leo Lassen (Les’ hero). Lila was also a heck of a softball player! Perhaps Dolly Keiter had known all of this when she made the re-introduction, but Les Keiter was completely surprised – and smitten. From Lila’s perspective, they had been dating for some time and close to falling in love, so she didn’t want to make a scene about the scoring business. She said, “I didn’t know if I should play dumb or show him my smarts.” Les, it turned out, loved her smarts. 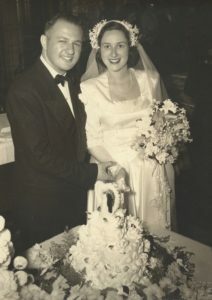 Les and Lila were married Sept. 9th, 1948 in Seattle, WA, and their honeymoon was an adventure! Lila had never been east of Olympia, Washington. So, they flew to Chicago (and saw the Cubs), to Cleveland (saw the Indians) to Niagara Falls, and to New York City, where they saw every team, Broadway Show, and Big Band they could. Then, they took in the sights in Washington D.C. before the happy couple ended their honeymoon in Los Angeles. 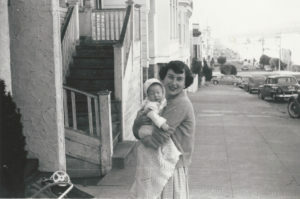 From there, they drove up the coast and then inland to their first home: an upstairs apartment in Modesto, California. 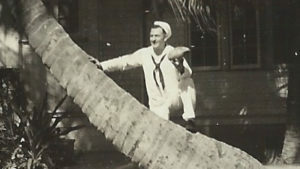 Les Keiter enlisted in the Navy in early 1942 (his 3rd job). He completed basic training, became Yeoman 3rd Class, U.S. Naval Reserve, and was shipped to Honolulu, Hawaii. 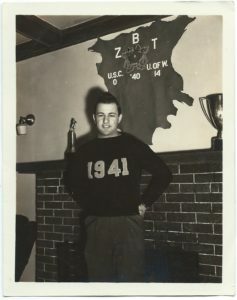 Les’s brother, “Buddy,” enlisted in the Navy shortly afterwards and was assigned to the SEABEES, 11th Special Battalion in the European theatre. Les was itching to be sent into combat, but he was assigned to clerical work for a commander’s office in the middle of the Navy Yard right there in Honolulu. That lasted about 2 months until the skipper called him in to question him about why he wasn’t an officer when he had a college degree. Les explained that he had poor color perception, which the Navy considered to be a physical defect and asked if anything could be done. The skipper resolved to see if he could help move Keiter forward. 6 weeks later, Keiter was promoted to Ensign and given 48 hours to prepare to ship out. First, he was sent to Dartmouth College in Hanover, New Hampshire for 6 weeks in officer training. Next, he was shipped to Fort Schuyler, Long Island, New York for 6 more weeks of training. Then, he was assigned to Port Hueneme in Southern California to train with the ACORNS, which was an airfield operation unit assigned to work behind the Marines and SEABEEs on a recaptured island. By August, 1942, Les was finally sent out of US territory with ACORN 15 – towards the Russel Islands, just north of Guadalcanal. The ACORNS arrived in New Caledonia, then went on to Noumea, headquarters for the Pacific Command under Admiral “Bull” Halsey. It was there, upon seeing a place in which several Marines and SEABEEs had been killed by an explosion a week earlier, the war, for Les, suddenly felt real. Upon arriving on the Russell Islands, the Harbormaster directed ACORN 15 to work with the SEABEEs 11th Special Battalion. But Billy was not deterred and asked the harbor master about it. In a thrilling coincidence, after heading to Europe, the Navy had sent Buddy right to where Les was stationed! The reunion was so joyous, it even made the papers back home in Seattle. Shortly after working together, Buddy shipped stateside and Les was reassigned to a communications outfit, bouncing from one Pacific Island to another for over a year, before landing on Peleliu, Palau, where Les was finally given a job he was most suited for: running the Palau Armed Forces Radio Station. He was the station manager, and the station had a full staff right in the middle of the war! They played records, did the news, and, of course, Les did sports. He announced boxing matches, and he even had his own show covering baseball, including an exhibition visit and game with the navy All-Stars, which included big leaguers Pee Wee Reese and Scooter Rizzuto! Not long after his stint on Palau, Les, too was sent back stateside for reassignment. Les stepped off a seaplane on San Francisco’s Treasure Island on an unforgettable date – April 12, 1945, the day President Franklin Delano Roosevelt passed away. Five months later, the war finally ended, Les and Buddy both survived, and it was time for everyone to try to put their civilian lives back together. First job: Following his graduation from University of Washington, Les Keiter got a job as a summer relief announcer on KGA Radio in Spokane, Washington. 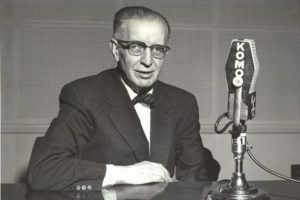 On July 1st, 1941, Les was officially on the air! His first duties ever as a broadcaster were reading program notes between shows, reading news breaks, station identifications, etc. After he had been on the job for 3 or 4 days, the program director brought Les into his office and said, ”You’ll never make it in this business. If I were you, I’d learn to drive a truck or something.” Les had a 2-month iron-clad contract for July and August of 1941, so he felt safe for 7 more weeks, at least. Second job: Les got a call from J. Elroy McCaw, who would employ Les many times throughout his career. He owned KELA radio in the twin cities of Centralia-Chehalis, WA and heard Les on the air. He hired Les to start September 1st to break him in as Assistant Sports Director. So, in his Model A Ford, Keiter drove with his parents to Centralia-Chehalis. The next morning, Les began his 2nd radio job, which included sweeping the place! So, finally, in the fall of 1941, Les Keiter began to learn the real ropes of the business. Then, of course his world and everyone’s dramatically changed forever. 2 months in to Keiter’s second job, December 7th, 1941, Japan bombed Pearl Harbor in Hawaii. KELA was taken off the air the next day, as were most west coast stations, because of the anticipated invasion of the Pacific Coast by the Imperial Forces of Japan. 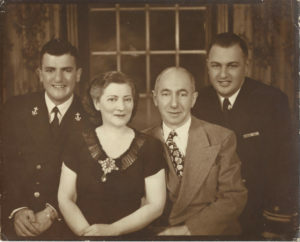 Keiter started in the Montlake District of Seattle, with parents Jake and Dolly Keiter, where they lived until he was 4 years old. From there, the family moved to the Capitol Hill District, and in 1923, Les’ younger brother, George “Buddy” Keiter, was born. 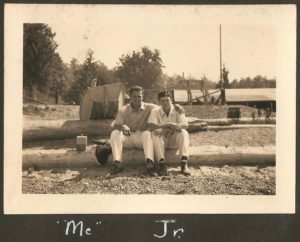 From age 9, Les and Buddy spent summers at Camp Orkila on Orcas Island of the San Juan Islands. Les’ prime interest at Orkila was Softball – he played until he got blisters, and then played some more. At 9 years old, it was at Camp Orkila that Les informed his camp buddies that he intended to announce from Yankee Stadium when he was grown. About 30 years later, that dream came true. And in 1997, the baseball field at Camp Orkila was renamed “Keiter Park”. Les attended Seward Elementary School and then Broadway High School in Seattle. He got his college education at University of Washington, where he was a member of the Zeta Beta Tau fraternity. 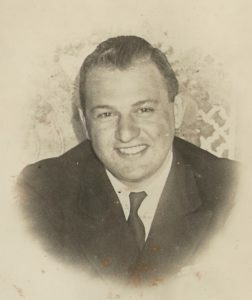 Les Keiter graduated in 1941. While attending U of W, Les played on the Baseball team in left field. He could be heard announcing the entire game, except when he was up at bat. Spectators came and crowds increased just to hear Les Keiter announce. A side note: Les’s father, Jake Keiter, was quite an athlete in his youth. He was asked to try out for the Chicago White Sox.